In 2010, Heyworth met with Roger L. Easton, Jr., chair of the Rochester Institute of Technology (RIT)'s Chester F. Carlson Center for Imaging Science. Easton had been working on new ways to image and decipher decaying manuscripts since the 1990s. At that point, X-rays (which can identify the iron in certain inks) and ultraviolet light had been in use for decades, but their reach was limited. There are hundreds of pigments, all of them responsive to different wavelengths. To properly exhaust most possibilities, there needed to be more options. The result of Easton's work was an arsenal of multispectral imaging hardware and software—photographic and analytical techniques that could take faded or erased text and, by reflecting different bands of light, make them visible to the eye for the first time in centuries. A very deliberate, sometimes exhausting practice, multispectral imaging is reviving vanished text and helping historians rewrite world history—a revolutionary new field blending science with the humanities. Using Easton's equipment, the two photographed Les Eschez d’Amours across a dozen wavelengths, each harboring the possibility of lighting up the pigments on the document. The images were loaded into processing software to further sharpen, enhance, and contrast. And there, viewable for the first time in hundreds of years, was the coat of arms: a unicorn and shield. Within two hours, Heyworth discovered that it was the von Waldenfel family of Bavaria, Germany, that had possession of the document prior to its known whereabouts in the 17th century. It was one missing piece of the poem's chain of ownership. Though it's been refined significantly in the past decade, multispectral imaging isn't an entirely new development. In 1996, Easton and colleague Keith Knox had successfully enhanced faded text from the Dead Sea Scrolls using filtered lenses on a Kodak camera, a process originally developed by the late archeologist Robert Johnston. Easton’s eureka moment came as the team removed two colors of the RGB (red, green, blue) model present in the visible spectrum from the digital image. When the Archimedes Palimpsest was rediscovered in the late 1990s, Easton saw an opportunity to put his techniques to a considerable test. Archimedes was a mathematician born in 287 BCE who had his elaborate formulas copied on dried animal skin known as parchment. In the 13th century, a monk had used an abrasive liquid—likely orange juice—to scrape off the ink describing Archimedes’ work. (At the time, parchment was difficult to find and often reused.) This recycling is known as palimpsesting. In this case, the monk took seven of Archimedes’ scrubbed manuscripts, tied them together, and used them as a canvas for his own writing. 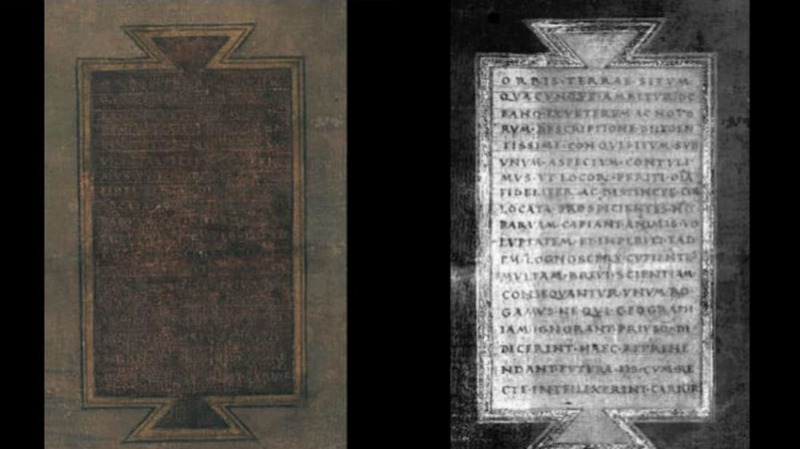 A page of the monk's work in normal light (L), imaged (M), and with the undertext made visible (R). The hidden text was written vertically on the page. Image Credit: RIT/Center for Imaging Science. After much of the Archimedes work had been completed—some passages that had been painted over and resisted all attempts under multispectral responded to a Stanford X-ray examination—Easton began helping Heyworth with his studies in 2010. Heyworth’s model for a portable imaging system, a key part of what he dubbed the Lazarus Project, would bring Easton’s abilities to a wider audience. They’d also entertain proposals from scholars eager to unlock the hidden knowledge of their own work. A request to examine some charred pages written by William Faulkner revealed never-before-seen poetry; the Library of Congress employed similar techniques to discover that Thomas Jefferson had erased “subjects” and written “citizens” in the Declaration of Independence. A segment of the Martellus map before processing, viewed under an (unsuccessful) wavelength, and finally showing the faded text. Image Credit: courtesy of Chet Van Duzer. In August 2014, team members traveled to Yale University, where the map is kept in the school’s library behind a protective enclosure. Their in-house archivists freed it from the wall and balanced it on an easel. (The map had been backed to help preserve it.) Easton used a quartz lens made by MegaVision to take 50-megapixel images of overlapping sections—55 in all—while an LED light source loomed over the canvas. Because the map’s surface is uneven and painted, varying the distance to the stationary lens, Easton had to refocus the camera as they made their way across. Courtesy of Chet Van Duzer. An overwritten illustration of a 5th century medicinal herb becomes wholly visible after being imaged. SinaiPalimpsests.org. At any given time, Easton, Heyworth, and other advocates for the burgeoning field of textual science are traveling the world. Part of their mission is to image delicate relics that their owners wouldn’t dare think of transporting. (RIT is currently assisting in imaging the library at St. Catherine’s Monastery, home to thousands of ancient folios written in 11 languages and left behind by visiting monks as far back as the 4th century.) Another is to train students and other scholars how to use the technology so more manuscripts can be preserved and better understood.